Handful Almonds a Day Keeps… – Green Fruit Effect! Almonds are an incredibly popular tree nut. Despite being high in fat, they are highly nutritious and extremely healthy. Almonds are the edible seed that grows on the tree Prunus dulcis, more commonly called the almond tree. Almonds are found in places like Iran, Saudi Arabia, Lebanon, Turkey, Syria, Jordan and Israel. The almond is a species of tree native to India, North Africa, and the Middle East, but the United States is now the world’s largest producer. The health benefits of almonds have been documented for centuries, and modern research is backing up many of these claims – there any many goods reasons for people to include them in their diet. The almonds we buy at the store have usually had the shell removed, revealing the edible nut inside.They are sold either raw (often referred to as “natural”) or roasted. Wild almonds (bitter almonds) contain glycoside amygdalin. Once an almond is crushed or chewed, this compound is converted into prussic acid (hydrogen cyanide) – a deadly poison.Eating a few dozen could be fatal. Domesticated almonds (sweet almonds), however, do not contain glycoside amygdalin and are, of course, safe to eat. You can eat almonds directly, preferably on an empty stomach to increase and speed up the absorption of their nutrients. You can soak them in water overnight so you can eat them the morning. Crushed almonds are also a wonderful garnish for a number of dishes. Almond is a highly nutritional nut and a rich source of vitamin E, calcium, phosphorous, iron and magnesium. It also contains zinc, selenium, copper and niacin, fiber, protein, fat, manganese. Compared to all other nuts, they are the most packed with nutrients and beneficial components. Almonds are a fantastic source of antioxidants. Antioxidants help to protect against oxidative stress, which can damage molecules in cells and contribute to aging and diseases like cancer. The powerful antioxidants in almonds are largely concentrated in the brown layer of the skin. For this reason, blanched almonds (skin removed) are not the best choice from a health perspective. Almonds are high in antioxidants that can protect your cells from oxidative damage, a major contributor to ageing and disease. Almonds, along with nuts and seeds in general, are often associated with improved levels of blood lipids and being good for the heart. The mono-unsaturated fats, protein and potassium contained in almonds are all instrumental in heart health. Vitamin E is an effective antioxidant and also reduces the risk of heart diseases, while the presence of magnesium in almonds can help avoid heart attacks. They help reduce the presence and impact of C-reactive proteins which causes artery-damaging inflammation. They are also a great source of folic acid. Therefore, they help to reduce the level of homocysteine, which causes fatty plaque buildup in arteries. Furthermore, the flavonoids in the skin of almonds combines with Vitamin E to form a powerful shield against artery wall damage. 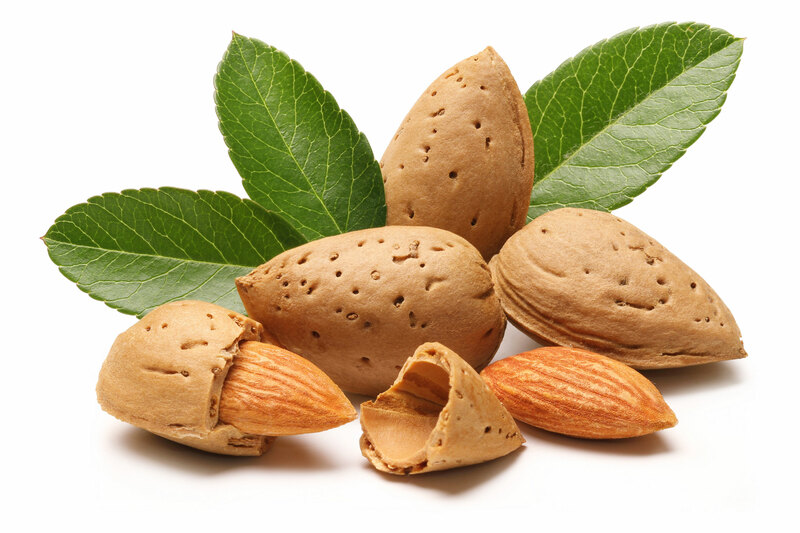 Research suggests that short-term almond-enriched diet may improve vascular function in asymptomatic healthy men aged between 20 and 70 years without any effect on markers of oxidative stress. Almonds are often considered one of the best brain foods. Almonds are a source of many nutrients which help in the development and health of the human brain. They have been connected to a higher intellectual level and they have long been considered an essential food item for growing children. They also contain two vital brain nutrients, riboflavin and L-carnitine, which have been shown to increase brain activity, resulting in new neural pathways and a decreased occurrence of Alzheimer’s disease. Studies have shown that almonds in the diet, as well as almond oil, is nutritive to the overall health and functioning of the nervous system. The magnesium in almonds may also help to lower blood pressure levels. High blood pressure is one of the leading drivers of heart attacks, strokes and kidney failure. Low magnesium levels are strongly linked to high blood pressure, indicating that almonds can be beneficial for blood pressure control. The potassium present in almonds helps to regulate blood pressure, and low levels of sodium, helps to control fluctuating blood pressure. The other nutrients also keep the body balanced in terms of other essential needs, which can prevents any other deficiencies. Balanced vitamins and minerals are essential for a healthy lifestyle, but if certain elements are neglected, the entire body can be affected, including anxiety, overall stress, and inevitably, increased blood pressure. Almonds contain gamma-tocopherol, a type of vitamin E that acts as a powerful antioxidant, fighting free radical damage and oxidative stress that are linked to cancer. Many studies find a link between nut consumption and cancer prevention, including a reduced risk for colon, prostate and breast cancers. Almonds are low in carbs, but high in healthy fats, protein and fiber. This makes them a perfect choice for diabetics. Almonds are extremely high in magnesium, a mineral that most people don’t get enough of. High magnesium intake may have major benefits for metabolic syndrome and type 2 diabetes. Almonds also help to reduce the reactionary rise in glucose and insulin levels after meals. This modulation offers protection from the dangerous spikes in blood sugar which diabetics often suffer from following a large meal, or a meal with an unexpectedly high level of sugar in it. Almonds help regulate the absorption and processing of glucose, making the entire process much smoother, and subsequently safer. Many people think that the word “fat” means something negative, but in fact, certain fatty acids are essential, and can be very beneficial for overall health. The body can’t create its own fatty acids, which is why we need to get them from dietary sources. Almonds have two very important fatty acids, both linoleic and linolenic acids. Those fatty acids help to reduce inflammation all around the body, which is a general condition that many people suffer from. The fatty acids also help to reduce the levels of “bad” cholesterol (LDL cholesterol), and they promote healthy skin and hair! All in all, these nuts pack a powerful, healthy punch. In addition to healthy fats and alkaline-forming molecules, almonds (especially the skin of almonds) contain probiotic components that help with digestion, detoxification and healthy bacterial growth within the gut flora — a key to actually utilizing nutrients from food and preventing nutrient deficiencies. A 2014 study by the Institute of Food Science & Technology in China found that when women ate a daily dose of 56 grams of almonds over an eight-week period, significant increases in the populations of healthy bacteria called Bifidobacterium and Lactobacillus were observed. Almonds are a good source of trace minerals, including magnesium and phosphorus, which is a crucial nutrient for building and maintaining strong teeth and bones. Almonds nutrition benefits include the ability to help prevent tooth decay, fight cavities, lower the risk for bone fractures and fight osteoporosis. Almonds do more than just lower LDL levels in the blood. LDL cholesterol can become oxidized, which is a crucial step in the heart disease process. Snacking on almonds has been shown to significantly reduce oxidized LDL. Regular consumption helps to increase the level of high density lipoproteins (HDL) and they reduce the level of low density lipoproteins (LDL). A study published in the Journal of the American Dietetic Association suggested that consuming almonds increases vitamin E levels in the plasma and red blood cells and also lowers cholesterol levels. Almonds are a great source of vitamin E and other antioxidants that nourish the skin and reduce signs of aging. Research finds that almonds nutrition contains high concentrations of catechin, epicatechin and flavonol antioxidants, including quercetin, kaempferol and isorhamnetin — compounds that fight skin cancer and damage by reversing oxidative stress from a poor diet, pollution and UV light exposure. Almonds’ healthy fats, plus their ability to improve circulation, also help keep skin hydrated and better able to heal wounds. Almonds are high in vitamin E. Vitamin E is the name for a group of fat soluble antioxidants. These antioxidants tend to build up in cell membranes in the body, protecting the cells from oxidative damage. Almonds are among the world’s best sources of vitamin E. Getting plenty of vitamin E from foods is linked to numerous health benefits. There are only 5 grams of carbohydrates in a cup of almonds, which represents only 2% of your suggested daily requirement for carbs. Many people see this as a good thing, however, as low-carb diets are very popular right now. Almonds give people a chance to boost their mineral and fat intake without adding too many empty carbohydrates. This makes almonds an excellent food to eat on the go or between meals! How many calories are there in almonds? There are 529 calories in a cup of almonds, but we don’t necessarily suggest eating that many in one sitting! That’s about 25% of your suggested calorie intake for the day! However, to put it in simpler terms, there are about 130 calories in one ounce of almonds, which equates to roughly 23 almonds. A healthy dose of almonds can help increase your good monounsaturated fat levels, and almonds contain tons of great minerals too! Almonds have a number of important health benefits, including the ability to protect heart health, thanks to the high concentration of beneficial monounsaturated fats, as well as increasing circulation, strengthening bones, protecting the skin, aiding digestion, and helping to control blood sugar levels. Almonds have also been connected to boosting cognitive performance and reducing oxidative stress in the body! Almonds can be a very healthy option for an easy snack because they deliver so many important minerals and vitamins that the body needs. Almonds contain significant levels of copper, iron, magnesium, calcium, protein, fiber, manganese, riboflavin, phosphorous and quite a few healthy fats as well. There are dozens of impressive health benefits that you can get by eating these delicious, nutrient-dense nuts! Almonds can be eaten in a number of ways, including topping off your yogurt or oatmeal with these healthy nuts, grinding almonds into delicious almond butter, salting and baking the almonds to be a replacement for junk food, including almonds in your protein or vegetable shakes, topping a salad with the nuts, sprinkling them on top of your pizza, or applying them as a topping on your favorite desert! Almonds contain a high level of fat. However, more than 50% of those fats are in the form of monounsaturated fats, which are good for heart health and are essential for organ function. However, they also contain “bad” fats, so it is important not to overdo it with almonds. A handful or two at a time is a great choice, and will give you a nice boost! Raw almonds are very good for you, but as with everything else, moderation in all things. The mineral content of raw almonds is impressive, and can help you with everything from osteoporosis to cognitive function. Similarly, the fat content may be high, but much of that is in the form of “good” fats. That being said, eating too many almonds can increase “bad” fat levels, and the high calorie count is also something you should be wary of. Note: However, just like almost any other food, almonds have their downside. They do contain oxalates, and excessive oxalates can cause crystallization, which can lead to a host of different issues. People that have kidney or gallbladder problems should avoid eating almonds.If you are allergic to almonds, it’s important to avoid any food products that may contain them and almonds also. ← Chia Seeds : The food of the Aztecs!